Lots of news today. Polls are in for 18 states and all of them are post Edwards. Was there an Edwards bounce? Yes. Kerry picked up 30 electoral votes since yesterday and now leads by 117 EV. Of the new state polls, Kerry is ahead in 12, Bush is ahead in 4, and one is an exact tie. Since all of these are battleground states, this is good news for Kerry. He is ahead in Ohio, Florida, Michigan, Wisconsin, and Missouri. There is no conceivable scenario in which Bush can lose the majority of these states and win the election. But before Kerry supporters start popping the champagne corks, note that the vice-presidential bounce is usually short lived. Two weeks from now we will find out how much real change there is, if any. Almost as noteworthy is the fact that Tennessee is tied. Bush is supposed to be miles ahead there. On the other hand, Bush is miles ahead in North Carolina, Edwards home state. If Edwards can't even bring in his home state, that is not a good sign for him. Upon request, we will now start putting the Excel spreadsheet on the website in .csv format for UNIX/Linux users. To avoid clutter, there will be no links to the .csv files. Just move the mouse over the Excel link and observe the URL in the status bar. Then type in that URL with ".xls" replaced by ".csv". The naming pattern for the files is completely regular so you can jump to any day quite easily by typing its URL. 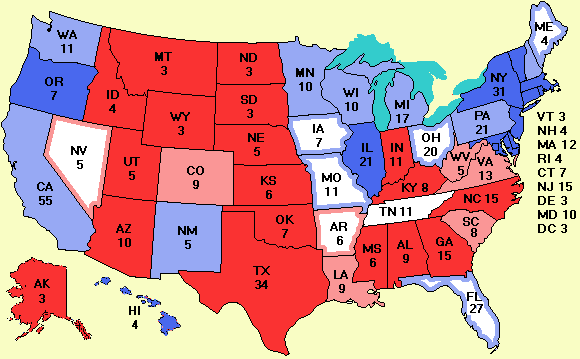 A new map of the 2000 election has been added. It shows who won which county. It is very instructive. Bush won 80% of the counties, even in the blue states. It clearly shows what that race (and this one) is all about. It pits rural, conservative, religious voters in the red counties against the urban, liberal, secular voters in the blue counties. The county map could just as well be labeled "Population density" with blue high and red low. Some new books and humor have been added. Try as we might to be perfect, sometimes errors creep in. If there is a conflict between the HTML pages/spreadsheet and the map, the HTML and spreadsheet win. The web pages are generated from the spreadsheet by a script and barring a bug in the script, should always be correct. The map is done by hand using Photoshop, so it is more error prone than the web pages.